Why Walk... When You Can Ride! 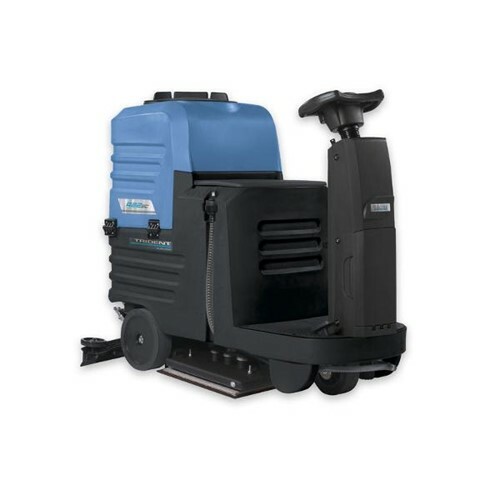 Double The Productivity Of A Walk-Behind Scrubber - In The Same Space! Outstanding Traction, Maneuverability and Cleaning. The low sound level - 54 Db (A) - means the machine can be used anywhere, at any time, without disturbing the people nearby and safeguarding the operator's health. Eco Mode also saves energy. By pressing a single button the machine stops immediately. Low center of gravity and excellent weight distribution ensures the utmost stability even on slopes. Automatically reduces speed on curves and turns. Automatically stops when pedal is released. The R22SC scrubs and dries in the same areas where a walk-behind scrubber would normally be used, but it?? ?s faster and more comfortable. The operator remains comfortably seated and can easily move in limited spaces, quickly passing from one area to another - even in an eleavator - in total safety without having to get off the machine. Ergonomic steering wheel with controls and display to make driving intuitive and safer. The operator isn?? ?t distracted, and the scrubbing functions are activated without hands ever leaving the driving wheel. Keep tabs on your machines remotely whenever you want and from wherever you want! Know where your machines are. Know who?? ?s using your machine and how it is being used. Know the health status of machines and batteries. Critical machine data is always being monitored for peak performance.